For the watch, it was a year before Ive settled on straps that clicked into slots. Ive later tested watchbands by wearing them outside the studio with other watches. The shape of the body, meanwhile, barely changed: a rectangle with rounded corners. “When a huge part of the function is lists”—of names, or appointments—“a circle doesn’t make any sense,” Ive said. I think he’s right. It doesn’t make sense. 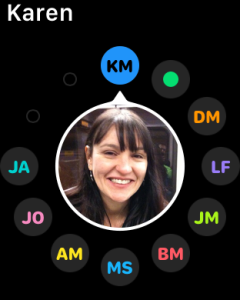 And, yet, what is the primary interface for contacts on the Apple Watch?